An extraordinary iconographic representation of the rich and diverse cultural heritage of India, it was developed in southern India by 9th and 10th century artists during the Chola period (880-1279 CE) in a series of beautiful bronze sculptures. By the 12th century AD, it achieved canonical stature and soon the Chola Nataraja became the supreme statement of Hindu art. In a marvelously unified and dynamic composition expressing the rhythm and harmony of life, Nataraj is shown with four hands represent the cardinal directions. He is dancing, with his left foot elegantly raised and the right foot on a prostrate figure — 'Apasmara Purusha', the personification of illusion and ignorance over whom Shiva triumphs. The upper left hand holds a flame, the lower left hand points down to the dwarf, who is shown holding a cobra. The upper right hand holds an hourglass drum or 'dumroo' that stands for the male-female vital principle, the lower shows the gesture of assertion: "Be without fear." Snakes that stand for egotism, are seen uncoiling from his arms, legs, and hair, which is braided and bejeweled. His matted locks are whirling as he dances within an arch of flames representing the endless cycle of birth and death. On his head is a skull, which symbolizes his conquest over death. Goddess Ganga, the epitome of the holy river Ganges, also sits on his hairdo. His third eye is symbolic of his omniscience, insight, and enlightenment. The whole idol rests on a lotus pedestal, the symbol of the creative forces of the universe. This cosmic dance of Shiva is called 'Anandatandava,' meaning the Dance of Bliss, and symbolizes the cosmic cycles of creation and destruction, as well as the daily rhythm of birth and death. The dance is a pictorial allegory of the five principle manifestations of eternal energy — creation, destruction, preservation, salvation, and illusion. According to Coomerswamy, the dance of Shiva also represents his five activities: 'Shrishti' (creation, evolution); 'Sthiti' (preservation, support); 'Samhara' (destruction, evolution); 'Tirobhava' (illusion); and 'Anugraha' (release, emancipation, grace). The overall temper of the image is paradoxical, uniting the inner tranquility, and outside activity of Shiva. Fritzof Capra in his article "The Dance of Shiva: The Hindu View of Matter in the Light of Modern Physics," and later in the The Tao of Physics beautifully relates Nataraj's dance with modern physics. 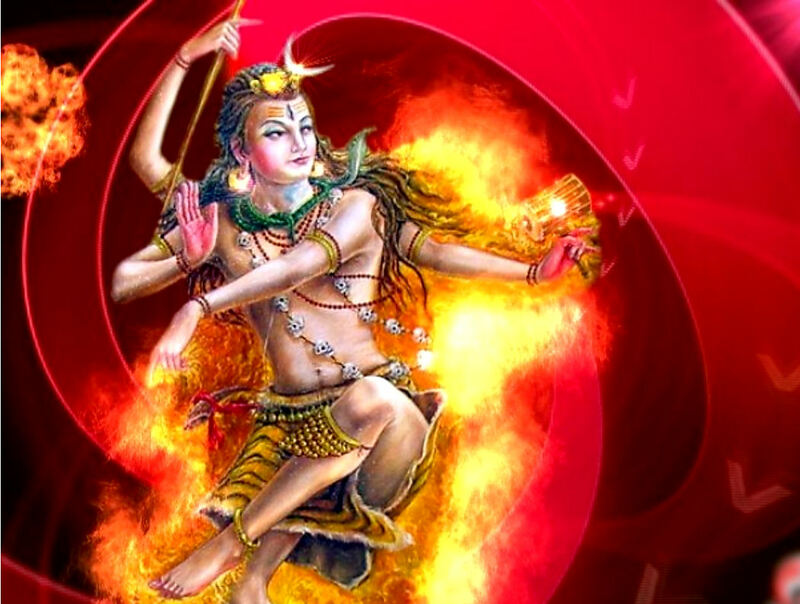 He says that "every subatomic particle not only performs an energy dance, but also is an energy dance; a pulsating process of creation and destruction…without end…For the modern physicists, then Shiva's dance is the dance of subatomic matter. As in Hindu mythology, it is a continual dance of creation and destruction involving the whole cosmos; the basis of all existence and of all natural phenomena." In 2004, a 2m statue of the dancing Shiva was unveiled at CERN, the European Center for Research in Particle Physics in Geneva. A special plaque next to the Shiva statue explains the significance of the metaphor of Shiva's cosmic dance with quotations from Capra: "Hundreds of years ago, Indian artists created visual images of dancing Shivas in a beautiful series of bronzes. In our time, physicists have used the most advanced technology to portray the patterns of the cosmic dance. The metaphor of the cosmic dance thus unifies ancient mythology, religious art and modern physics." Gives rhythm to the universe. Awesome site and a great article...! Tips to Purify Our Mind.